Here is the first in a series of interviews I am featuring from my new book, The Sustainable Design Book. I've chosen to highlight a few of my favourite makers whose work and craftsmanship fits as well on these pages, as on those inside the book. Chelsea Miller makes some of the most beautiful knives I have ever seen and I wrote about her work a couple of years ago here. 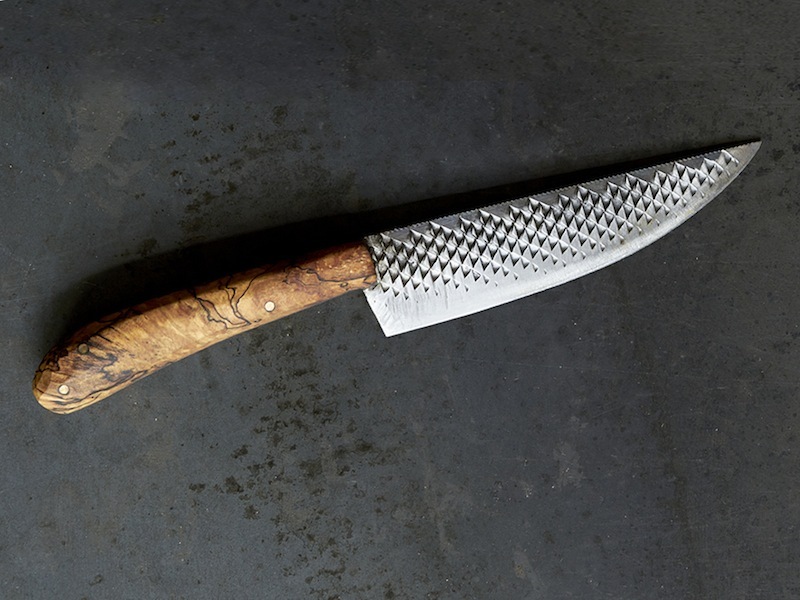 The knives are created by hand, from repurposed high-carbon steel taken from discarded tools, with handles of local maple, cherry and applewood. The result is incredible knives which are seriously functional with a unique aesthetic. How did you become a knife maker? I started making knives in my fathers blacksmith shop after having seen a knife my brother had made. I asked him to teach me and by the second or third step I had taken over. I gave that first knife to a close friend of mine and I still use it often. Describe your style? My style is nontraditional, inspired by materials that are not typically used for things beyond their original purpose. I am excited by textures and grain and letting each piece find its final form. How is your work sustainable? My work is sustainable in the sense that I am repurposing old farm and farrier’s tools and milling wood from the living forest where I grew up. It’s fun to imagine someone cutting cooking with what once was a file used to shoe horses, when otherwise they would have never come in contact with such a tool. What tools and materials do you use? I use high carbon steel tools, all made in the US and wood native to my childhood home in the North East Kingdom of Vermont. I cut the desired shape from these tools with a torch, then grind them to the optimal thinness. I heat treat and temper the blades, attach wood handles and many, many hours later chop veggies and grate cheese. What inspires you? My inspiration comes from a need for balance in my life. I live in New York City, I occasionally act in films, knife making gives me the meditative time I need to focus all my energy on creating something very simple in theory yet quite complex in reality. I am also inspired by children and their power to create an imaginary world. I try to spend a lot of time there. To buy a copy of The Sustainable Design Book with 35% discount, you can use the code PROCTOR35 at the Laurence King checkout. I had always thought that the best chopping boards were very simple, angular ones, but Hampson Woods have proved me wrong as I am now hooked on their distinctive handles. Chances are that you've seen the elegant curving wooden handle of a Hampson Woods chopping board in a photoshoot or shop lately. Their work is popping up all over the place, and I love that they have come up with a design that is instantly recognisable as their own, yet still very timeless and classic. Hampson Woods evolved as a pairing of woodworker, Jonty Hampson and artist and designer, Sascha Gravenstein. Together they design and create hand made, small-batch products using wood sourced from their own woodland in Cumbria. This is a rare treat, meaning they can know exactly where each product originally had its roots. Tell us about what you do? 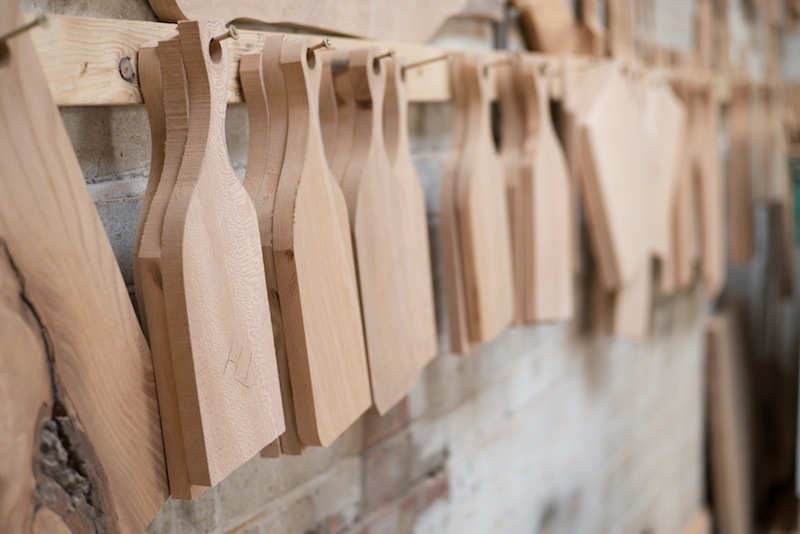 We are small-­batch producers of wooden products for the home - serving boards, porridge spoons and hanging racks. 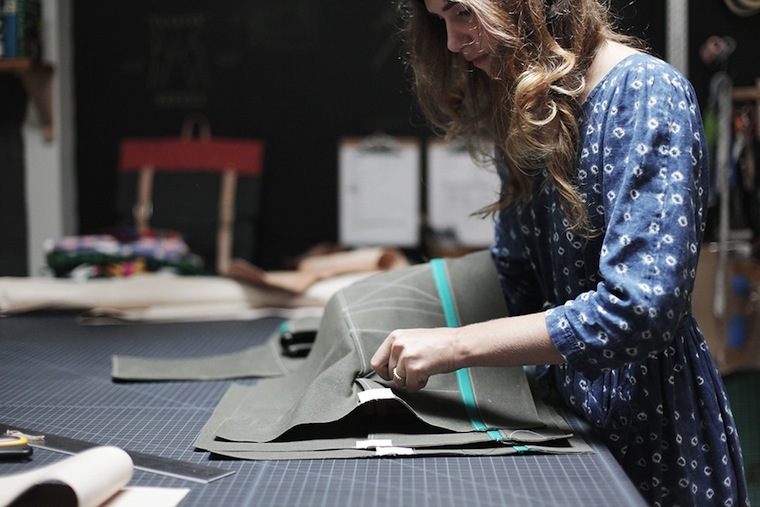 All of our work is designed, made by hand and finished in our Hackney workshop. What materials do you use and why? We predominantly work with London Plane, a hardwood with an incredible depth of colour and variation in grain. It has been little used these past decades, and visually always keeps you guessing. As it’s not grown commercially, it is only really available when a tree comes down or has to be removed, so it's not the easiest to source. 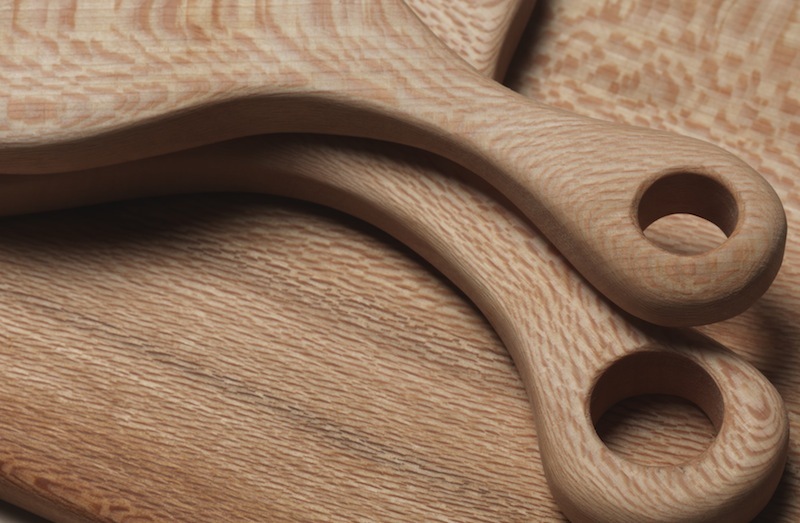 We also work with Elm, Ash, Oak and Sycamore, all also sourced from within Britain. We only acquire timber if we know its provenance; where it once stood. What is your favourite wood to work with? My current favourite is Ash. It is almost buttery in its consistency, yet so versatile and strong. Sycamore is growing on me too, it finishes like glass and has a real sheen to it. Wood is such a beautiful and giving material. ­Even years after it stood, it never seems to lose its energy. As it is worked, and especially when oiled, new shades and subtle pleasing variations in colour will appear. As it ages, its texture and character will change, ­ and whatsmore, no two pieces are ever the same. What techniques do you use? The majority of our work is sanding, from shaping right down to finish. 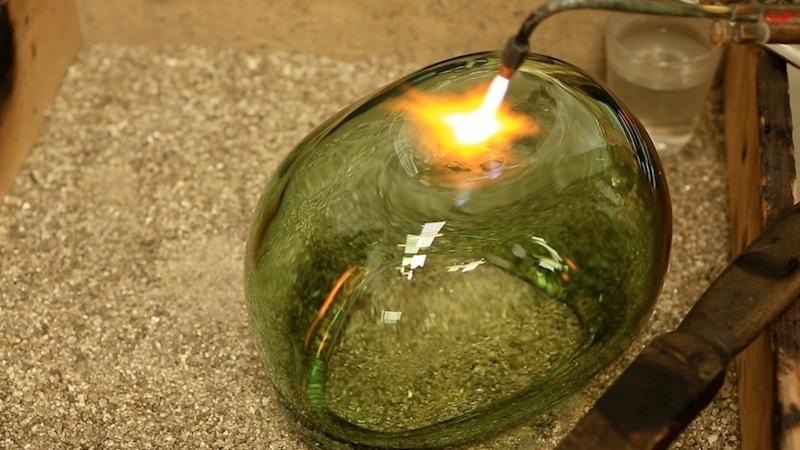 We always work with the piece in hand, and with patience, ­taking it, bit by bit, to a comfortable and smooth form. We're ­ always ensuring a very high quality of finish. What/who inspires you to make your work? The world around us, friends, family, Henry Moore, David Nash. Rebirth of timbers that have ended their previous life ­and the simple pleasures of working by hand. Can you recommend a good book? I’m an admirer of Ruskin ­but only in small doses. For reference, The Wood Book and for fun, The Treehouse Book. Where can we buy your work? From several shops across London, and the UK and also from our website. What are your plans/ideas for the future? Collaboration with craftsmen of other materials to see­ how beautiful timbers and grains can sit alongside other naturally­ occurring, texturally­ contrasting materials. Also to take on more hands, and branch out into other parts of the home. Workshop photographs by Robin Sinha. I love the beautiful contrasts in Akiko Hirai's Kohiki ware, it looks strong yet delicate and I was fascinated to learn that it is inspired by face powder. Two worlds collide - make-up and ceramics - I hadn't thought about glaze like that before. Trust me, Akiko's combination of white on black clay is difficult to pull off. It's a look that I've been trying to emulate recently and I've been far off the mark! Perhaps I can pass it off as adolescent experimentation? Akiko's work is available is several great shops and galleries, including The Cold Store, Maud & Mabel, and Mint, and I am delighted that she agreed to be next-up in my series of Q&A's with inspirational makers. 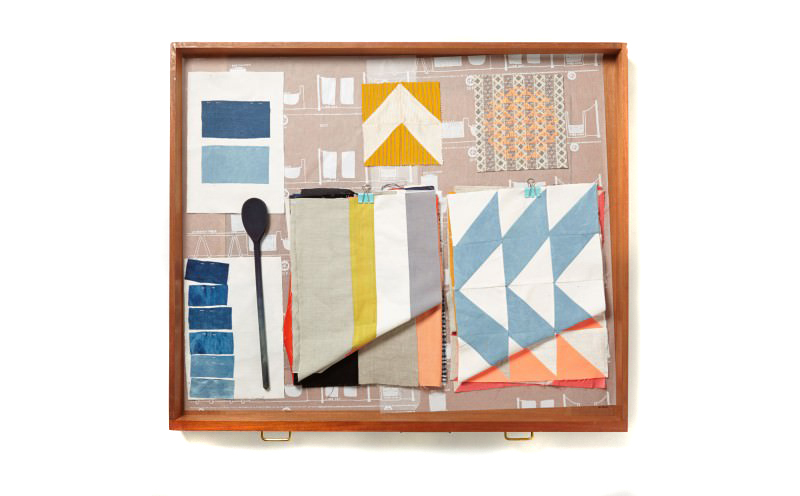 Catarina Riccabona weaves wonderful, colourful, slubby linen textiles, the kind that call out to be stroked and explored. The cloth is handwoven in small, limited editions with different weave structures and combinations which keep your eyes gently dancing over the fabric. Catarina also has an admirable ecological philosophy, using a lot of undyed, plant-dyed and recycled yarns. She was kind enough to answer a few questions about her work below. Tell us a little about what you make? I’m a textile designer and hand-weaver. I make functional pieces such as throws and blankets, sometimes also scarves and cushions. But my focus is definitely on throws and blankets. What materials do you use? Linen is practically in every piece I make (there are only a few exceptions). I love to work with it and I love the aesthetic of linen. It tends to become more beautiful with use. My practice is based on an ecological philosophy, so I use a lot of undyed yarns like linen, hemp, wool and alpaca (from the UK and Europe) as well as plant-dyed, second-hand and recycled yarns for colour. What techniques do you use and why? Weaving by hand (as opposed to working with a mill) gives me a great deal of flexibility in terms of weave structure combinations, irregularity and yarn types. I use this fact in my throws that could be described as whole compositions rather than repeat designs. One of my favourite techniques is block threading. During weaving you can separate out certain groups of threads and make them do something different to the rest. I like to play with this kind of juxtaposition of colour and texture. What/who inspires you to make your work? I admire the quality and feel of many tribal textiles. That trace that’s left from the making process by the human hand… small variations, irregularities, imperfections. There is something honest or even innocent about such pieces. Sometimes they seem to have been made quite intuitively. For me it’s a kind of timeless beauty that is also warming and comforting. How/where do you sell your pieces? I sell directly from my studio at Cockpit Arts, Deptford, (by appointment) or during our twice yearly Open Studios. I also sell through places like The New Craftsmen and other independent shops/galleries. From SS15 Liberty will have my work too. And I work to commission. Please recommend a good book? ‘Colour: Travels Through the Paintbox’, by Victoria Finlay. My first year tutor at Central Saint Martins who taught us colour theory recommended it. Each chapter is dedicated to one colour and lots of peculiar facts about it… Any plans/ideas for the future? From 26th to 28th February I will be in residence at ‘Atelier’ run by The New Craftsmen. 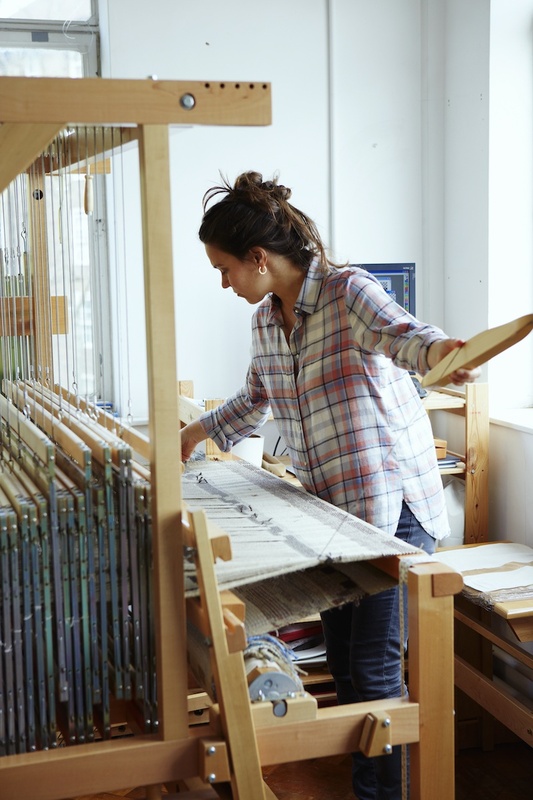 During London Craft Week I will be weaving in St James’ church (Piccadilly, 7th & 8th May)! I also look forward to the opening of Field Gallery in Bruton, Somerset, in April 2015. In the more distant future there could be a very exciting collaboration project on the horizon but I’m afraid it’s much too early to say anything about it. There are so many amazing wall hangings around at the moment. I love that this craft is enjoying a resurgence as I've always been partial to a bit of fibre art - the weirder the better for me. I caught up with rising star of the scene Maryanne Moodie to find out more about her work. 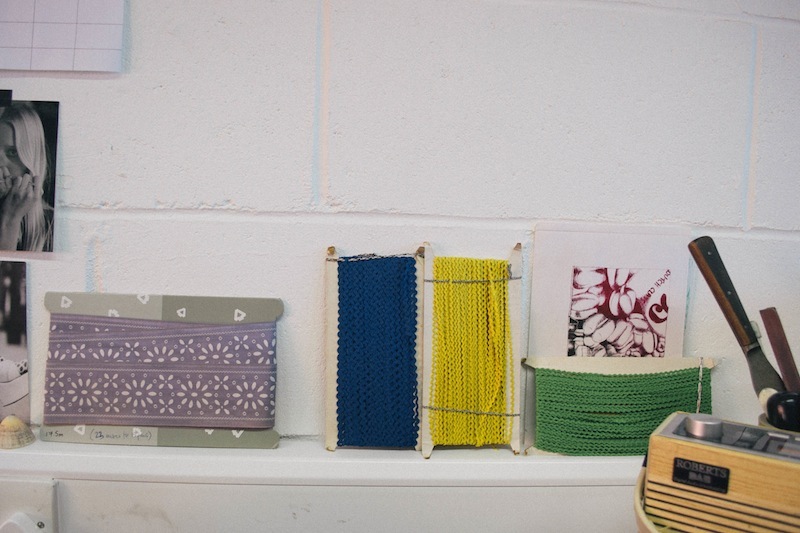 How and when did you start weaving? About three years ago. I was searching for a craft to pursue and when I found weaving, something inside me just turned on. I was hooked! What materials do you use and how long does each piece take? I use all types of yarn and textiles in my work. I use lots of vintage yarn as well as small batch, hand spun and hand dyed wool. I also use handmade beads sometimes, as well as things I find at the hardware store. What do you enjoy most about the process? I enjoy working closely with my clients to ensure I create a piece that is wholly them. It will be a piece that has the privilege of hanging in their personal private spaces. I want to create a piece that will bring good vibrations into their homes and their lives. Where do you sell? I sell only via commission at the moment. I feel so lucky that I can enjoy the process in an individual way that is different for each client. Do you have any plans for the future? Yes, I am setting up weaving classes in NYC and Australia and I am commissioning a carpenter to help me put beginners weaving kits together. I am also filming an online weaving course that I hope to have live in April/ May. All very exciting! To see more of Maryanne's work, please visit her website or follow her on Instagram. 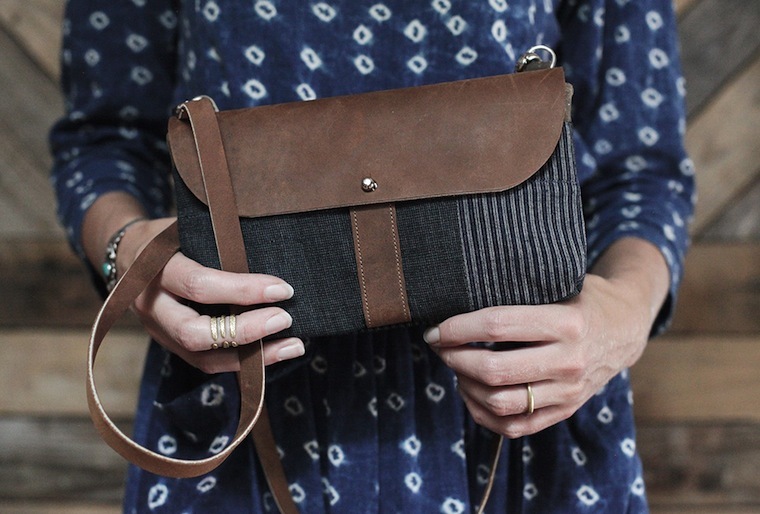 Karie Reinertson makes beautiful handcrafted bags under the name of Shelter. I first saw her work on Madesmith and was intrigued to find out more. 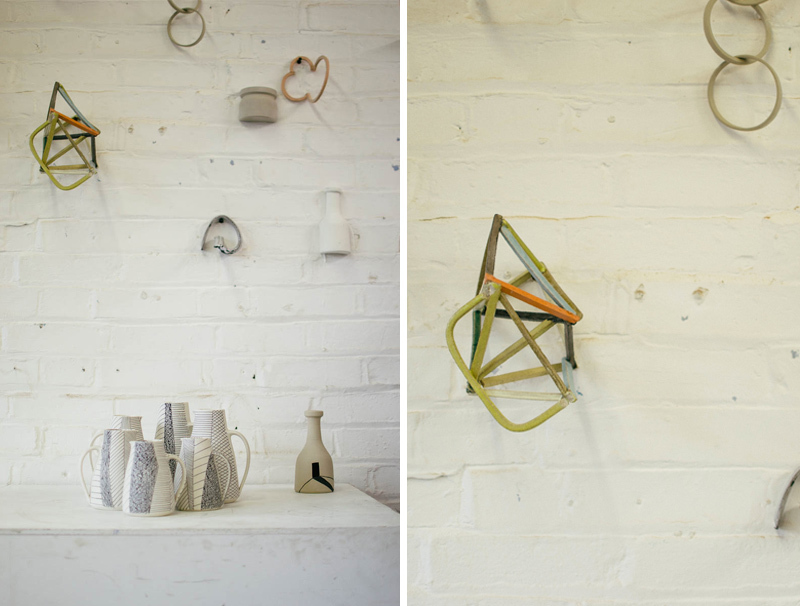 In December I visited the studio of one of my favourite ceramicists, Nicola Tassie. 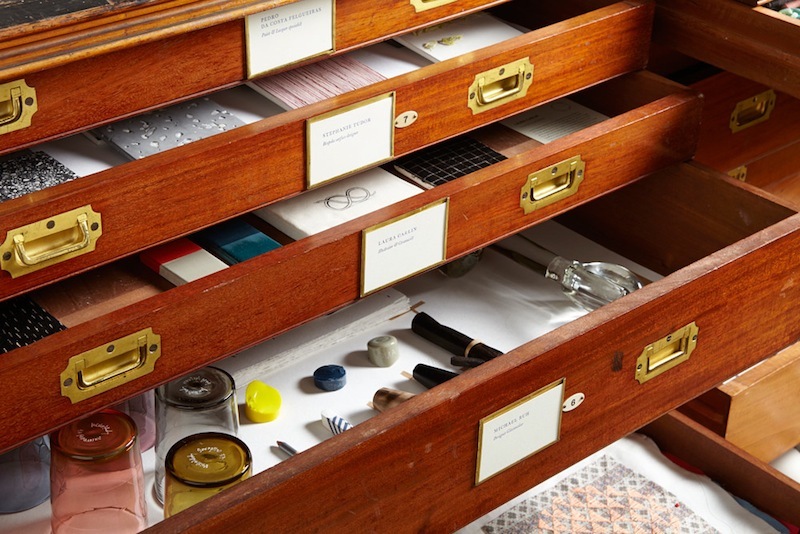 You may recognise her work from Margaret Howell or The New Craftsmen. Each pot is slightly different but all display a defiantly strong form and experimental use of clay and colour. I am in awe of Tassie's experimentation with clay. In fact, every morning I drink my coffee out of one of her cups, and each day I think how incredibly beautiful it is. For me, that simple, faceted clay mug symbolises everything that I love about design; it's accessible, well-crafted, well-designed, and my life is enriched by using it. 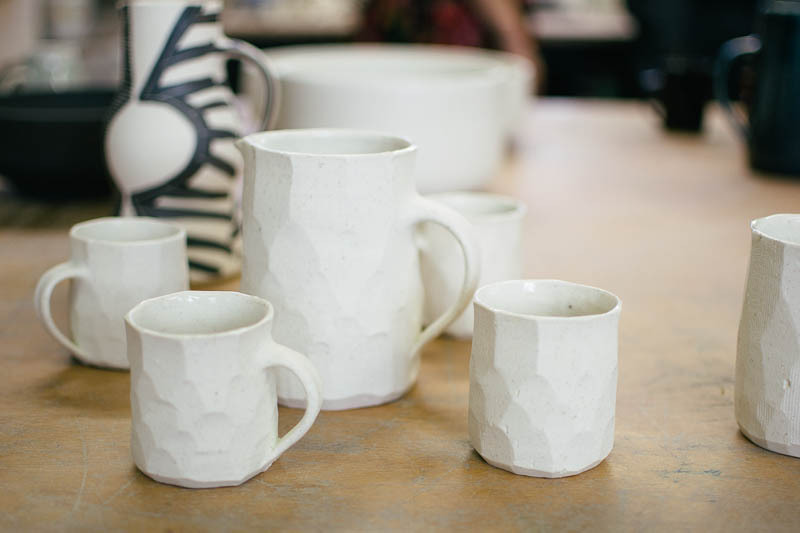 How did you start making ceramics? I actually studied painting at college (the Central School of Art), but was curious about clay, perhaps through choosing early rock art for my thesis subject. A friend and I visited the ceramics department and asked if we could have a go at throwing, the technician gave us some crank, told us to hold on firmly, and left us to it. After a short while our hands were bleeding and we wondered at the toughness of potters! Cross department interest was not encouraged at Central! It obviously didn’t put me off though, and a few years later, after graduating I joined an evening class at my local adult education institute and have not stopped since. What made you choose to concentrate on tableware? 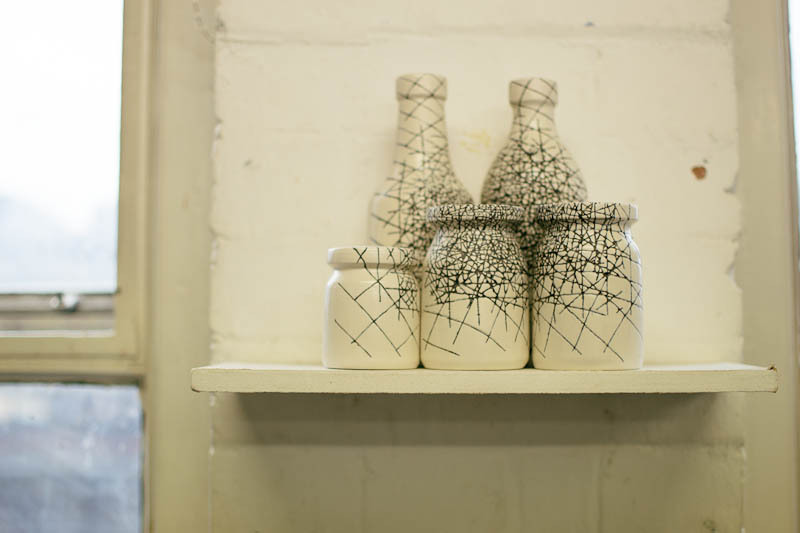 My first interest in making ceramics was in the surface - drawing imagery with brushes and sgraffito marks, as a way of extending my life drawing practice - and so I learnt to throw as a means to make pots quickly and small bowls and cups and jugs were about all I was capable of at the beginning! Then the form of the pot started to influence the imagery, and the simple variations of how a bulging or convex wall of a cup or bowl effect the surface design has become a main preoccupation. The function of the pot - picking it up and using it – also gives an added tactile dimension to explore. I think it’s interesting to make small scale domestic works that fit into homes, and become part of everyday living as well as carrying a specific meaning or history. Do you look to any other potters/artists for inspiration? Definitely, all the time. I love looking at pots, paintings and objects. The ceramics department at the V&A is a wonder. I love English slipware, German salt glaze jars, Lucie Rie, Miro’s ceramics, Marianne de Tray and more. I’ve just seen the Paul Klee exhibition at Tate Modern – wonderful, contained paintings - he is so inventive with the surfaces and colours, it’s given me some thoughts about glazing. It’s also interesting to see the new work contemporary artists, like Jessica Jackson Hutchens, are making with ceramics and clay. Your forms are very simple and beautiful. How do you develop new shapes? I feel I’m rather slow at making new shapes. There is a continuity in making, with each form following on from the other, the process often leading to a new idea. For instance, out of curiosity, I was throwing with some heavily grogged clay and finding it hard to work with for too long or to get it thin enough, so that the finished jug was rather too heavy for use. I decided to shave some of the clay off from the outside and ended up with a lighter, ‘faceted’ jug and new shape! I’m definitely more of a vessel maker than a bowl maker and prefer subtle curves and close handles. You've recently started making lighting - tell us a little about that? In Paris I saw an exhibition of French 1950/60’s potter George Jouve. 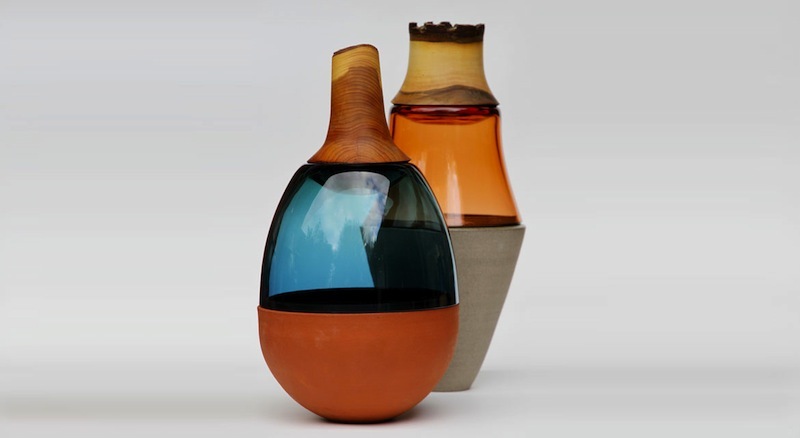 I was impressed with his expansive range of ceramics, he made tabletops, stools, sculptures, wall finishes and lamps. It’s an opportunity to work on a larger scale, building form with simple geometric shapes-cones, cylinders and spheres. They are thrown in different parts and joined together, or else I add coils to a thrown base and pull up, taking time to let it dry off a bit before continuing with another coil until they look finished. At the moment I’m glazing them very simply in either matt black or white, as there is enough play with the shadows across the form when the light is switched on. What different clays and glazes do you use? I make ranges with different types of clay, at the moment I’m using a light buff stoneware, a black stoneware, a beautifully smooth mid-range Keuper Red and Limoges porcelain. I also add different grades of grog to get different surface effects. I keep a lot of glazes in the studio, either made from recipes (they always turn out different from the description!) or ready-made powders from the pottery suppliers. I have phases of working with particular ones, but a lot of my current porcelain work is left raw on the outside and glazed with a glossy transparent on the inside. 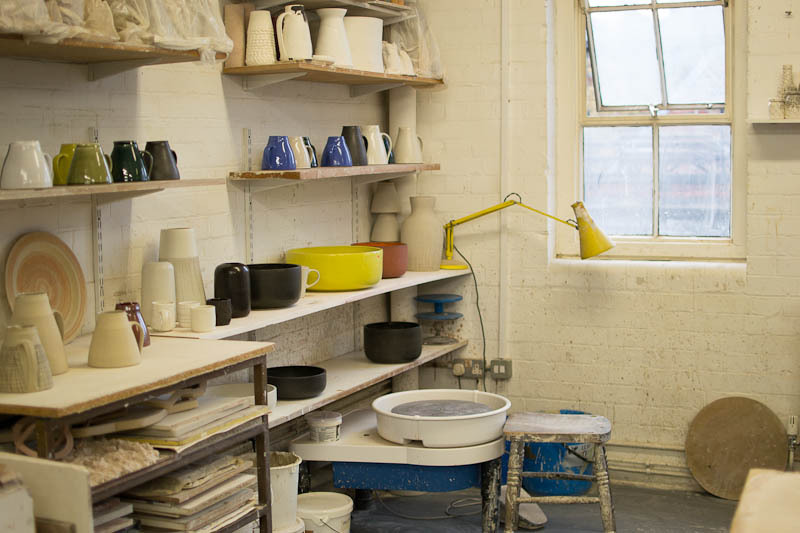 Where do you sell and exhibit?The Wills Lane Gallery in St Ives, Contemporary Ceramics in London, Maud and Mabel in Hampstead, London, Gallery Top, Matlock, Derbyshire, The New Craftsmen and Margaret Howell shops in London , Paris and Tokyo. At the moment, I also am in an exhibition: Mud and Water, at the Rokeby Gallery, until 6th March 2014. Rose Choules creates the most beautiful handmade moccasins from her studio in North Cornwall. I visited recently to explore the space and to find out more about her work. For Rose the power of art and craft is life changing; she is that rare artisan who has dedicated herself to a hand-made life and who describes her work as the transference of love from one human who makes an item, to another who wears it. "For me this is the spice of life" she says, "and what I dedicate my everyday to." Rose designs two collections of moccasins a year and each pair are made to order in her workshop. My favourites are the mixed suede and leather fringed ankle boots for autumn/winter 13 and the cute mini children's versions. 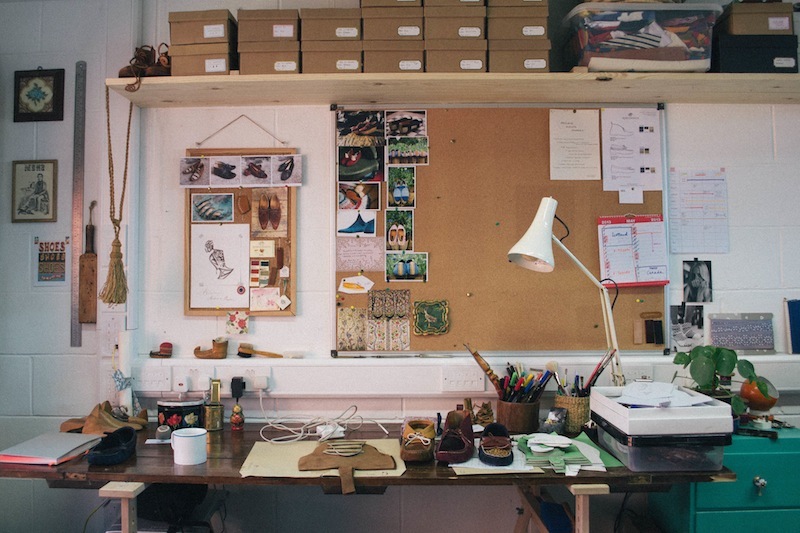 Rose also teaches moccasin making workshops, in London and at her studio - something that I would love to have a go at! She is currently running a number of unique workshops in Saskatoon, Canada, as part of the newly formed Young Artisans Co-operative. The aim of these special workshops is to help find a way in which craft can be used to alleviate poverty. To see more of Rose's inspiring work, please visit her new website.